Last week, I got the opportunity to go out to Seattle with some friends. The trip started off with one of my traveling mates telling me that there was a little mix up on our flights. Ended up, I was going to be taking a separate route as them to Seattle. We were going to all land about 30 minutes apart in Seattle but I was flying with a layover in Chicago Midway and they were going through Houston. I’m not going to lie, at first, I was a little upset…I hadn’t seen my friend in a while and I was hoping that we were going to be able to catch up on the planes. At the same time, I couldn’t really do anything about it, so I just had to make the most of my time and embrace the adventure. Turns out, the time that the flights provided me were exactly what I needed. I was forced to disconnect from all of life’s things. No phone, no computer, no emails, no internet, no texting, no social media. Nothing. Y’all know the dreaded airplane mode…BUT I was able to focus and pray about some of the things that I have been struggling with, all while knowing that on the other end of my flights I had an awesome adventure ahead of me in Seattle. It was much needed and so refreshing. We should take the approach everyday in our quiet time that on the other end of our time with the Lord there is going to be a crazy adventure. No matter if you are going all the way across the country to Seattle or walking to your office that is just a few blocks away. God promises us all sorts of adventures (good and bad) AND he promises to be with us in those adventures. I challenge you today as you read this to take a couple of minutes and think about ways that you can channel this new view of airplane mode. How can you take time and truly dedicate it to the Lord with no outside distractions? Thus began my prayers and search for why this theme of trust was coming up so much for me. If you asked me, “Do you trust in the Lord?” I would answer with a resounding yes! When I was wrestling with the fear of going to Kenya two years ago, I came to a moment in my faith where I decided I trusted in the Lord with my life. I felt strong in the truth that He was with me everywhere, and that He would never leave me. I believed in His sovereignty over my life no matter where my geographical location was. So, that is where I rested for awhile, in the peace of knowing that the Lord is sovereign, all powerful, all knowing and I trusted in Him with my life. Sounds great right? No trust issues here. Hah. The Lord began to challenge me in ways that I felt I had control over. I began to wrestle with the tension of how can I so easily trust the Lord with my life and with the big ideas, yet day to day I was not aligning that same trust to the decisions I made. Are you giving to God generously? Are you taking your thoughts captive? Are you living on mission for the Lord’s kingdom or for your own kingdom? Through these questions he showed me that in reality I was trusting more in myself than in His truths for me. One that I find the most difficult to grasp is the the second question, because so much of it is subconscious. These are some of the revelations the Lord shared with me, and that I currently wrestle with on a daily basis. This is a big ONE for me living in the beautiful season of singleness. This world does not value the ways of the kingdom, over and over again I found myself allowing worldly ideas, opinions, sayings, and thoughts dictate my feelings about my life. I was giving satan free reign of my thoughts. If I am weak in my thoughts, there he will be. Recently I did the Armor of God study, and thank you Priscilla Shirer for reminding me that I must gird myself in truth (Ephesians 6:14). If I don’t know the truths of God, how will I be able to stand against the schemes of the devil? It becomes this cycle, and I can get caught in it with one thought. If I trust in God’s word and what He says about who He is and who I am, then every time I let thoughts like: you will never get married, entertaining the idea of someone as my husband thus leading to unrealistic expectations, the cultural narrative of life goal=get married and have children, or even that I’m in a season of waiting…if I believe those lies, I am letting the truths of this world dictate what I believe about God, and that does not reveal a heart of trust. He calls us to take every thought captive (2 Corinthians 10:5) not just a few of them, every one of them. The truth says that a mind set on the Lord brings peace and life, and that we should dwell on his thoughts (Romans 8:6). (Philippians 4:8) The reality is, I was letting those thoughts run in my mind like wildfire because if I didn’t say it, then surely I didn’t believe it, but those thoughts did exactly what the devil wanted them to do; distract me. They distracted me from the Lord and his calling for me. I am called to be an ezer and satan knows I cannot do that when I’m thinking about how old I am and my time line, and that everyone else around me is married with children and I’m not. I cannot pour my heart out to middle school girls when my mind is preoccupied with waiting on the next season of life. I cannot fully display my trust in the Lord if I’ve convinced myself that this is just a season and I am waiting to get out of it. No! The Lord needs me in this season, with my strengths and my personality, to do the work that He needs right now for today. There is no waiting, it is a present and active life he calls me to live. And I must trust in him. If I trust in Him, this life that I so freely give to Him in big ways should also be reflecting that in all the small ways, even down to what I think on a daily basis. Capturing my thoughts and aligning them with truth will inevitably guide me further into giving generously out of obedience, as well as living on mission for the Lord’s kingdom. The less I think of myself, and the more I think of him and his truths, the more ways my life will display an unwavering trust in the One True God, and ultimately guide me to live out my calling. Yesterday, the pastor of my church gave an interesting welcome to the congregation. He used the cross that hangs on the pulpit as an illustration of the type of people that he wants to welcome at our church. My church is fairly new and as my Pastor put it…”we don’t have very many holy or meaningful churchy symbols.” The one thing we do have is a cross that hangs from the pulpit that was given to our church. It is made out of mesquite wood and has fallen apart and been broken multiple times. I’ve noticed the cross, but never really thought much into it. Our pastor removed it from the front of the pulpit. He held it up in the air and it seemed to be flawless. Then, he turned it around and it was held together by metal bracings and wood glue. He used the cross as a symbol of our church. We all look like we have it together on the outside, but on the inside we are cracked, broken, and mangled. We are all cracked in some sense. Physically, mentally, or emotional. Physically, I think about two of my best friends who have gone through ACL surgeries and had to basically reteach themselves to walk and run. You would never know what they have gone through if you didn’t see the evidence of scarring around their knee. Mentally, I think about different cracked relationships I have had to work through in my life and how they effect the way I approach potential future relationships. Emotionally, the fractured relationships have left me hurt and confused. I thought we were going to __________. Why pursue a relationship if you are just going to be let down? What’s the point? Are they going to treat me like __________ treated me? Christ has paid for all the cracks, fractures, and breaks by what He did for us on the cross. As you grow with Christ…He will give you confidence because your hope and faith will be in Him and not in worldly things or beings. I challenge you to be more bold and open in your relationships. Come as you are…Be yourself. Don’t put on a front that you have it all together even though that is what our culture today has us think is a necessity. We all have cracks…so don’t be afraid to show them. Live life against the flow. I mean, seriously….who thought of these phrases anyway? Who do we know that has marched even close to the tune of a million miles? And an African elephant is a 12,000 pound creature. The average human eats only about 4 pounds worth of food each day. I’m no rocket scientist, but that sounds to me like we’re talking about 3,000 days’ worth of eating elephants. That’s over 8 years! In the midst of my friend’s completely overwhelming situation, where life seems too tough and almost hopeless all together, here I am wanting to offer up metaphorical advice on eating elephants. Wow. I found myself thinking about my friend’s situation in my quiet time. I found myself reflecting the great obstacles in my own life. As I the wheels in my head turned, I opened up the word and I ran across a story in the Bible that really shed some light on everything. The story, in John 5:1-15 (read it, it’s good! ), recounts the tale of a man who was in dire circumstances. The story tells of a disabled man who was trying to make his way down to a pool of water called Bethesda. You see, this particular pool of water was rumored to have healing powers. The blind, lame and paralyzed came from all over to dip themselves in the pool, searching for some end to their ailments and a new start to the rest of their life. This particular man in the story had been disabled for 38 years. Can you imagine the size of the elephant this guy was facing? The frustrations and questions he must have had….searching for healing and answers, not knowing what to do next. I wonder if his buddies ever chimed in, “You know how to eat an elephant, right”? As the man tries to make it to the pool with no avail, the story pans over to Jesus’ point of view. Jesus asks the man, “Do you want to get well”? Um… let’s stop right here. Why does Jesus ask this guys that question? Of course he wants to get well! He’s been crippled for 38 years. I’m sure he’s tried everything at this point. 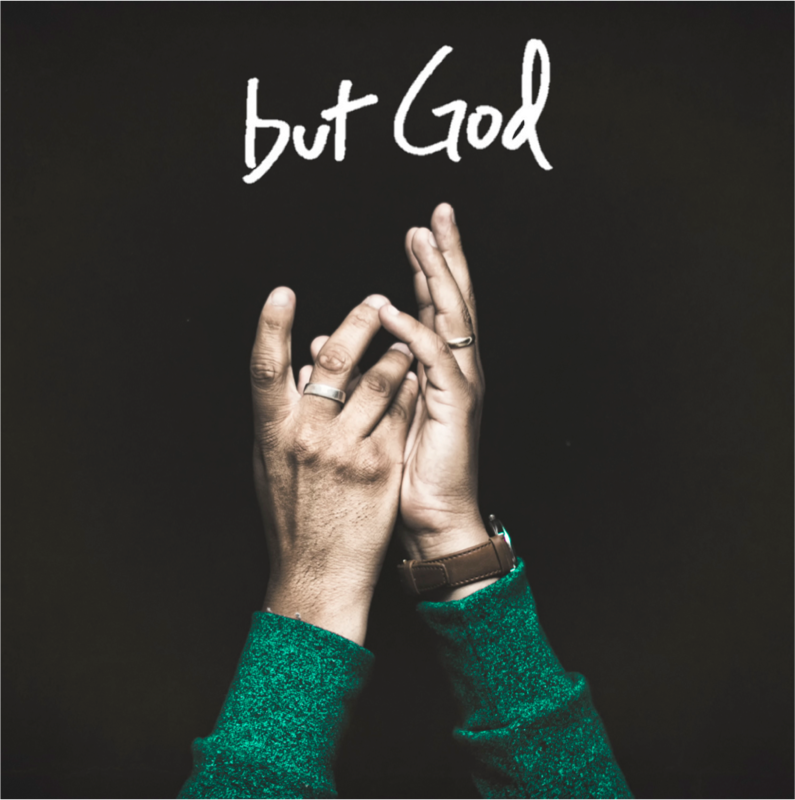 The disabled man looks at Jesus and more or less says, “I’m trying man.” “Every time I’m about to try to get in the pool and get healed, someone else goes down ahead of me and I’m left in the same boat. The same situation where I left off.” I can almost feel his pain. The years of heartbreak and disappoint. He’s found himself in the same situation he’s been in since he can remember, trying to do everything in his power and finding himself catching the short end of the stick once again. Jesus response to the man blows my mind. He tells him “Get up. Pick up your mat and walk”. Wait…that seems too easy. You just want him to pick up his mat and walk? What about all of the struggles he’s had Jesus? What about all of the problems that have been building up over the past 38 years Jesus? The solution is just for him to pick up his mat and walk? ….and then it hit me. In the face of an obstacle that seems bigger than life and impossible to tackle, Jesus told the man to get up. With an elephant in his way, a life that had been getting the best of him, a hopeless situation where there was no end in sight, Jesus told the man to take a bite. He gave him one simple command. Get up. Granted, this simple command seemed like an impossible task, but the man trusted in Christ. He trusted his next step in the hands of the one true healer and redeemer. The one who holds eternity in the palm of his hand. The one who loves us more than we can ever imagine and wants to give us life to the fullest. He listened to Jesus. He put his faith in the one simple instruction Jesus gave and then responded. 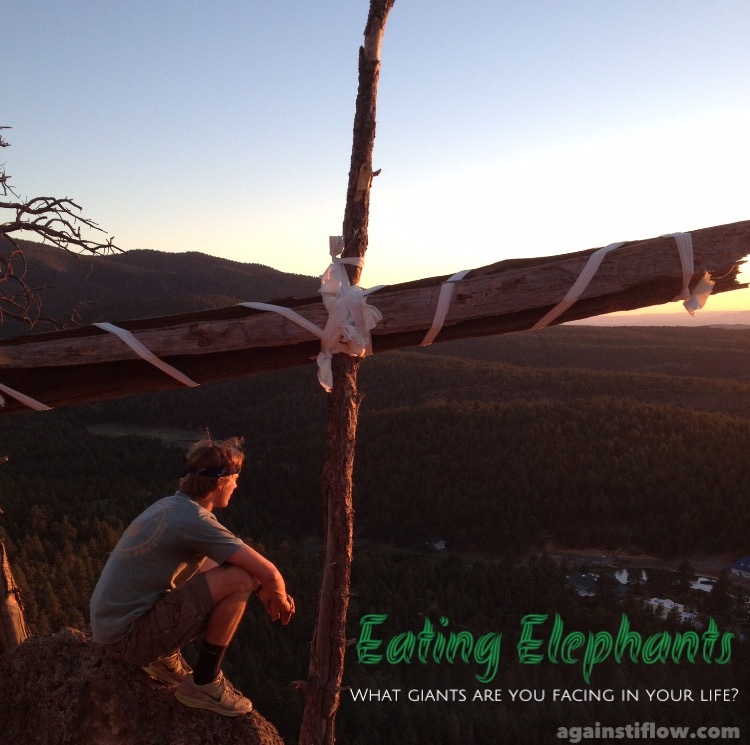 What giants are you facing in your life? What hopeless situation have you been facing and trying to resolve, but you’ve found no relief? Give it to Jesus. Get in the word and seek him with all of your heart. Ask him what your next step should be and listen. No matter how simple, how impossible, how crazy, trust him and he will blow your mind! I trust that in this season of life he’s giving us all a next step, even if it is be patient and wait. Take the first bite. Trust him with your next move and then the one after that. One day at a time, let the Creator of the Universe who has gone before make our path straight. God promises that He will be a lamp unto our path if we seek Him. We might not be able to see the end in sight, but this story offers hope and encouragement to faithfully trust in His goodness and take the next step!